Wow! I've never seen the weekly poll differ in outcome so much in my whole 3 ½ years of blogging! All three contenders were extremely popular: the Mojito Cupcakes, the Cosmopolitan Cupcakes, but in the end it was the Piña Colada Cupcakes who won by one vote. Not only for me, but for you as well; alcohol has a certain allure. In moderation of course! I owe piña colada's a lot of thanks. Not just for making summer vacation days even more enjoyable, but for converting me to coconut. My whole life I detested coconut (I'm sure I've mentioned it on this blog a couple of times before). Then, last Summer, I was introduced to piña colada's in Portugal, and slowly but surely I began liking coconut. Now I love it! And how easy is it to have shredded coconut around the house?! It's cheap, lasts forever and it makes an ordinary cake so much more special. True to an authentic piña colada recipe, this cake contains coconut, pineapple and rum. Yum! The white buttercream frosting is topped with shredded coconut as well. Though I have to say that next time, I'll use a whipped cream frosting instead of buttercream because I think it would go better with the cake. Rating: 4 out of 5. - In a small bowl, combine rum, coconut milk, pineapple juice, and vanilla. Set aside. In a medium-sized bowl, whisk together the flour, baking soda, and salt. Set aside. In a large mixing bowl, beat butter and sugar until light and fluffy. Add eggs to the sugar mixture one at a time, beating well after each addition. Alternately add the flour mixture and the rum mixture, beating well after each addition. Fold in the coconut and pineapple. - Fill cupcake liners ¾ full. Bake at 350°F for 20 - 25 minutes or until cupcakes bounce back when lightly touched. I used my White Frosting recipe topped with shredded coconut and a few adornments for topping. These cupcakes look so tropical. 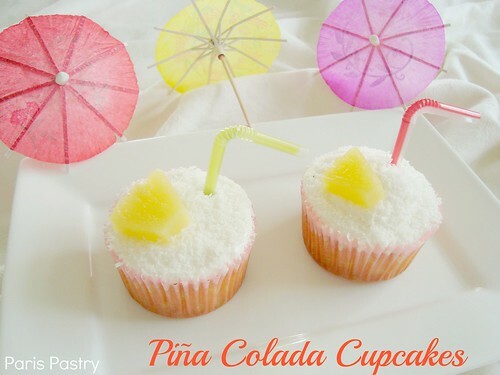 I've only had a (virgin) pina colda once and it was marvelous.To turn it into a cupcake is a great idea! You always make the presentation look so inviting. I'm sure they are delicious and they look stunning - I love the way you styled them with the straws and parasols - beautiful! These look delicious and fun! I will make these for a summer party. Haha cool cakes:) Well its over 30 degres in GBG today. Im not that in to alcohol it makes me more weird than usual haha:) Im high on life. I love drinks in cupcake form! Thanks for sweet words:) Well Ill try to explain Inredning in swedish is decor in english and Vis in swedish is wise in english. So if you put them togheter its decorwise haha..doesnt work that good in english. 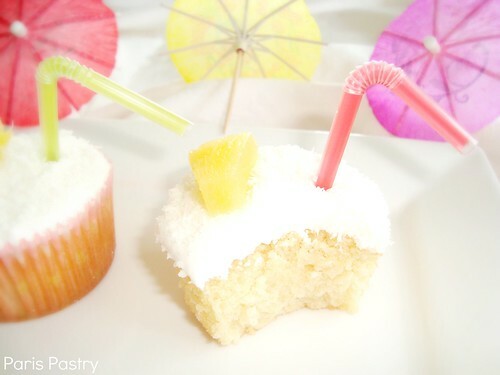 making these for my friends b-day party since her favorite drink is Piña Colada :) Thanks foe the recipe! I added an extra teaspoon of pineapple extract to the mixture for a more tropical taste. I used Captain Morgan dark rum for a stronger rum taste and for the frosting I made a normal buttercream frosting but added the coconut milk as a substitute for ordinary milk. Was devine!